A Rooftop Affair is back! 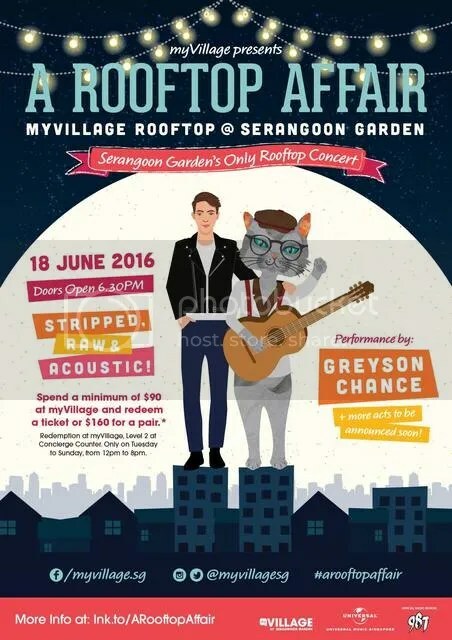 This time, music lovers will get to enjoy a night of stripped, raw and acoustic music with American singer-songwriter, Greyson Chance. Last year, The Fifth Parlour had the opportunity to enjoy the first session with Us The Duo and local artistes, Gentle Bones and ShiGGa Shay. Greyson Chance was in Singapore for a concert back in 2012 and I was there to witness this young boy captivating the hearts of young girls during the concert. Just to refresh your memory, Greyson shot to fame when his performance of Lady Gaga’s Paparazzi went viral which got him invited to The Ellen DeGeneres Show. Since then, he has been on our radios with hits after hits such as Unfriend You and Waiting Outside The Lines. Greyson is set to perform his new songs this coming June. If you would like to be part of it, you have to spend $90 at myVillage to redeem 1 invite or spend $160 at myVillage to redeem 2 invites. For more details on how to redeem invites to the event, please visit the official website.